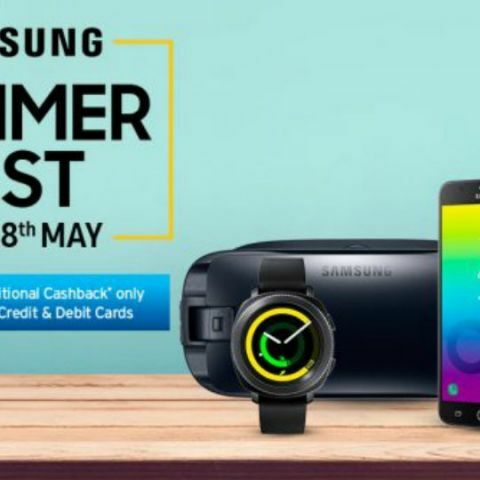 The Samsung Summer Fest sale starts from today and will go on till May 28 on Samsung Online Shop. During this sale, audio products from Harman Kardon and JBL will also be available at a discount. Samsung has kicked off its Summer Fest Sale which starts today and will go on till May 28, 2018. The Samsung Summer Fest Sale will be held on Samsung's Online Shop. As one would expect, the company is offering deals and discounts on a range of its products ranging from TVs, to smartphones. In addition, the sale would also include audio products from Harman Kardon and JBL. The company’s online store will offer special deals on select products starting at 11AM and 7PM for the duration of the sale. Further, Citibank will offer 10% cashback on credit and debit card transactions for select products during the sale. Some of the deals active during the sale include the Samsung Galaxy S8 and Galaxy S8+, which will be available for Rs 37,990 and Rs 43,990 respectively. The Samsung's mid-range smartphone, the Galaxy A8+ is priced at Rs 29,990. The DeX Station accessory is available for Rs 5,999, while the JBL Flip 4 speaker is available at Rs 7,999. In wearables, the Gear Sport is availble for Rs 18,99, while the Gear Fit2 Pro is prioced at Rs 10,999. Samsung 32-inch HD Flat TV J4003 Series 4 is priced at Rs 17,199. Samsung has also partnered with other services during the sale. Foodpanda will offer discount vouchers on their platform to consumers buying products during the Summer Fest Sale. Further, the company will do a lucky draw during which 100 Samsung Scoop speakers will be up for grabs. Anyone who makes a purchase during the sale is eligible for the lucky draw. The sale comes a day after Flipkart kicked off its own Apple Week sale on the portal. As the name would suggest, the sale sees discounts on a number of Apple products ranging from smartphones, to laptops.